Home > Find a Surgeon > M. Kirk Moore, M.D. Cosmetic Surgery in Jackson, Wyoming and Idaho Falls, Idaho. We combine medical expertise, an artistic vision, and outstanding customer service at our cosmetic surgery practice to make Wyoming and Idaho patients' dreams a reality! We specialize in obtaining beautiful, natural results, and in making our cosmetic surgery patients feel confident and attractive. Our state-of-the-art surgery suites in Idaho Falls, Idaho and Jackson, Wyoming are equipped with the most modern technology available, allowing us to achieve optimal results. To make plastic surgery affordable for everyone, we offer the Cosmetic Fee Plan, a financing plan that allows plastic surgery patients to pay for their procedures in low-interest installments- Click here to learn more. Choosing to have plastic surgery is a major decision- it's in the same class as accepting a marriage proposal, purchasing a new home, or finding a new career. There are a number of factors to consider when seeking plastic surgery, including choosing the right procedure, facility, and plastic surgeon. But after meeting Dr. Kirk Moore and his friendly, extensively trained plastic surgery staff in Idaho Falls and Jackson, Wyoming, the decision will be an easy one. At our plastic surgery practice locations in Jackson, Wyoming and Idaho Falls, Idaho, we provide personalized attention to every patient we treat. We see only one patient at a time, scheduling appointments accordingly so that no one feels rushed or passed over. From the initial plastic surgery consultation to the postoperative follow-up, our professional team members walk each patient through the entire process. This ensures that all questions and concerns are addressed. In addition, our plastic surgeon has a soothing bedside manner, helping our patients to feel at ease and welcome. Our state-of-the-art plastic surgery suites in Idaho Falls, Idaho and Jackson, Wyoming are equipped with the most modern technology available, allowing us to achieve optimal results. To learn more about the financing plans available at the practice of plastic surgeon Kirk Moore, M.D., please contact our offices in Jackson, Wyoming or Idaho Falls, Idaho. About M. Kirk Moore, M.D. 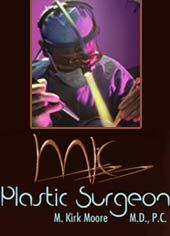 Dr. Kirk Moore is an expertly trained plastic surgeon with more than a decade of experience. Throughout the years he has remained dedicated to helping his patients achieve the balanced facial features, toned bodies, and youthful skin of their dreams. He specializes in a full range of plastic surgery procedures, including breast augmentation with implants, skin rejuvenation, liposuction, and rhinoplasty. No matter what type of plastic surgery enhancement Idaho and Wyoming area residents are seeking, Dr. Moore can make that dream a reality! Dr. Moore's formal training is second to none. After earning a master's degree in applied human physiology from Hahnemann University in 1989, he enrolled at the University of Miami School of Medicine and obtained his medical degree with honors in 1993. Dr. Moore then completed the prerequisite general surgery residency at St. Joseph's Hospital in Denver, Colorado, and a plastic surgery residency at the University of Colorado Health Sciences Center. Dr. Moore is Board Certified by the American Board of Plastic Surgery and a member of numerous organizations, including the Idaho Medical Society and the Alpha Omega Alpha Honor Medical Society. A plastic surgeon licensed by the Idaho Board of Medical Examiners and the Wyoming Board of Medical Examiners, Dr. Moore attracts plastic surgery residents from all over Wyoming, Idaho, Utah, and Montana. When not achieving amazing plastic surgery results for his patients, Dr. Moore enjoys traveling around the world, playing soccer, water skiing, snow skiing, and spending time outdoors. In addition, he is fluent in Italian and proficient in Spanish and French.